One of the most significant trends in the research community is the concept of "integrative science," meaning that researchers from different disciplines work together on projects, pooling their knowledge and resources. This cooperative approach is embedded in both the name and the architecture of the UO's innovative new Robert and Beverly Lewis Integrative Science Building, which celebrated its grand opening in October. "What makes the Lewis Building unique is that it was specifically designed from the ground up for interdisciplinary research," says Kimberly Andrews Espy, vice president for research and innovation and dean of the graduate school. "Everything from the placement of the labs to the prevalence of shared spaces was designed to encourage the kinds of connections that will result in collaborative research projects." The 103,000-square-foot, $65-million building, the latest addition to the Lorry I. Lokey Science Complex, houses a variety of research clusters, encompassing chemistry, biology, psychology, neuroscience, and more. The different sections of the four-story building intersect at an atrium complete with open stairways, stadium seating, and comfortable couches to encourage informal interactions and just plain hanging out. On one side, a wide section of the opaque glass wall serves as a three-story whiteboard where passersby can stop and brainstorm ideas. The design concept works, says associate professor of psychology Mike Wehr, whose research lab is in the new building. "You bump into somebody from a different department on the way to the printer or to get a cup of coffee. You say, 'Hey, I just had this crazy idea,' and suddenly you're writing on the whiteboard, cooking up an idea for an experiment. It wouldn't have happened if you had to walk across campus and make an appointment." Another feature inviting collaboration is the building's unusual interior design: all the walls that face the atrium are made of glass (some clear, some opaque). This makes scientific research seem more accessible, says chemist Chris Knutson, a postdoctoral researcher at the Center for Sustainable Materials Chemistry. "Science is like martial arts," he says. "It has a ranking system. If you are low in rank, you may not feel like you have the ability to communicate with those high in rank. But in this building, it's like window-shopping. You look through the window and see science you want to do, and a near-peer doing it, and you are encouraged to participate." The Center for Sustainable Materials Chemistry is housed in labs on the fourth floor and also has a "characterization" facility in the basement where new products are evaluated for usefulness. "We are combining quite a few labs in one space," Knutson says. "This increases face-to-face time with many groups and pools together a greater number of resources into a single area." One of the center's current projects is to invent less energy- and resource-intensive ways of making thin films for electronic applications such as computer display screens and flat-screen TVs. "We are using water as a means of processing high-grade electronic material into thin film, instead of using a vacuum, which is energy intensive and wasteful," Knutson says. "This will revolutionize how sustainably these devices are manufactured." Working in the burgeoning field of "green chemistry," these researchers are also coming up with exciting new ways to use nanotechnology to store energy derived from solar panels. "The big hurdle for solar is storage," Knutson explains. In the lab, energy collected from solar panels is used to split water into oxygen and hydrogen, a clean-burning fuel. "It's way better than battery storage, which has limited applicability to large-scale power generation," he says. "The hydrogen fuel can be used to run a car or on a spaceship, without releasing carbon or greenhouse gases." Down on the first floor, Wehr, the psychology professor, is utilizing an exciting new science called optogenetics to study how the auditory system works. By implanting photosynthesis genes into certain neurons in the brains of mice, he can use light to stimulate these neurons and literally turn them on or off. "Optogenetics is one of the most amazing genetic tools to hit neuroscience in my lifetime," Wehr says. In one study with mice, Wehr turned off an entire class of auditory neurons that are inhibitory. Other neurons began to respond more and more vigorously to sound, and the mice then responded to quiet sounds as though they were loud. "It was like getting rid of the brakes in your car," he says. From this, he theorized that the inhibitory neurons are critically involved in tuning out background noise. "They are poised to be like a volume knob in the brain. You can turn up the volume on things you want to hear, and turn down the volume on things you don't want to hear." As people age, Wehr says, they often have trouble hearing conversations in a noisy room, even though they hear quite well in a quiet environment. "Understanding what the neurons are doing helps us understand age-related hearing loss," he says. "This could ultimately translate into treatment or therapy that could improve people's lives." Improving lives is also a goal for psychology professor Phil Fisher, whose research focuses on how kids' early stressful experiences shape the architecture of their developing brains, later affecting learning, memory, developing friendships, and school performance. Using the research-grade fMRI machine installed in the Lewis Building's basement, Fisher is collaborating with two colleagues who each have research studies under way. Jennifer Pfeifer is studying how social rejection leads kids to take risks, and Elliot Berkman explores how behavioral training may be able to help kids have more control. "This is so exciting for us," Fisher says. "So many of the families and children we work with have stress dating back to infancy and even the prenatal environment. This work has incredible relevance for people in high-risk populations." Fisher's enthusiasm about the possibilities for collaborative research in the new building is palpable. "The new facility is a total and complete game-changer," he says. "It will attract researchers from around the world as well as high-level grad students. I think it will transform the landscape of integrative science, and we can create changes on a grand scale." The Lewis Building was funded in large part through private donations from Robert '46 and Beverly '48 Lewis and Lorry I. Lokey, along with William Swindells, the James R. Kuse Family Foundation, and Rosaria Haugland. About $35 million more came from federal and state grants and state bonds. Scientific research facilities, it turns out, are a good investment—at the UO last year, more than $120 million in sponsored research was brought in from sources outside the state. 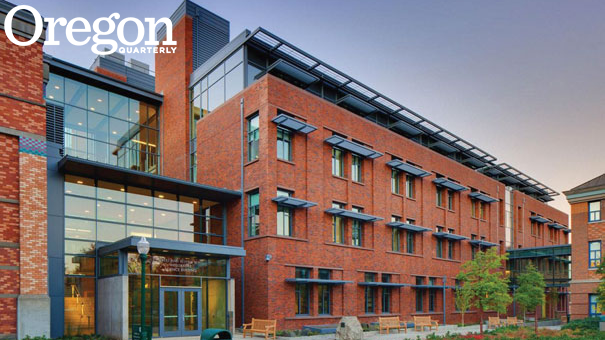 In addition, research innovations at the UO generated nearly $7.9 million in licensing revenue for the Oregon economy. A subtler form of economic development can be seen in the two "Partnership Spaces" in the building. These are available to the private sector, giving companies access to many of the high-tech tools both in the Lewis Building and the adjacent Lorry I. Lokey Laboratories. As of press time, the UO was talking with interested tenants. "Our private industry partners will soon be able to use those same high-tech tools and technologies and the building will catalyze external partnerships involving a host of academic, research, business, and entrepreneurial organizations," Espy says. But just as important as the advanced research going on within the Lewis Building, of course, are the opportunities the new facility affords students. "Students will have unprecedented access to labs and high-tech tools and equipment," Espy says, "allowing them to gain critical thinking skills while training for the technologies of the future."